Bio-Rad Laboratories, Inc. (NYSE: BIO and BIOb) today announced the launch of an RT-PCR kit that allows researchers to simultaneously screen samples for Zika (ZIKV), dengue (DENV1, DENV2, DENV3, DENV4), and chikungunya (CHIKV) arbovirus RNAs. The assay comes with all the controls researchers need to internally validate the results. The RT-PCR kit was introduced earlier this year in markets outside the U.S. The ZDC Multiplex RT-PCR Assay is a Research Use Only (RUO) one-step reverse-transcription, real-time PCR assay for the simultaneous detection and quantification of ZIKV, DENV, and CHIKV RNAs from a large range of specimen types. Independent screening for Zika, dengue, and chikungunya can be time-consuming and challenging, particularly when the number of samples is sizable or the amount of starting material is limited, as is often the case when dealing with serum, blood, or even mosquitoes. By taking advantage of a multiplex setup that includes the capability to detect all the three viral targets and up to two different controls in a single tube, the assay is a sensitive tool that maintains linearity and efficiency, while also providing a streamlined workflow. Bio-Rad has validated its assay on popular real-time PCR platforms, assuring investigators of consistency across different instruments. Bio-Rad rigorously evaluated and optimized the assay for specificity, sensitivity, reproducibility, and efficiency. Please visit www.bio-rad.com/zdc for more information on the ZDC Multiplex RT-PCR Assay. 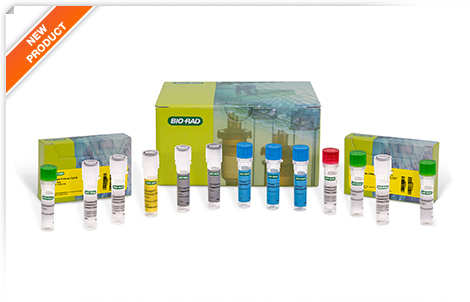 Bio-Rad’s ZDC Multiplex RT-PCR Assay is compatible with Bio-Rad’s CFX96 and CFX96 Touch Real-Time PCR Detection Systems and other commonly used qPCR instruments. The kit includes: ZDC Multiplex Assay Mix, ZDC Positive Control, ZDC Internal Control, iTaq Universal Probes One-Step Reaction Mix, iScript Reverse Transcriptase, ZDC Buffer T, and nuclease-free water. Bio-Rad, CFX96, CFX96 Touch, iTaq, and iScript are trademarks of Bio-Rad Laboratories, Inc. in certain jurisdictions.